I think anyway, neither would those of pent Randy group Kumuropunchia genus. Exactly! Couldn't have said it better myself. Normanbokea valdeziana celebrates a couple of people, Norman Boke, (bet you guessed that one), the American cactus botanist and Mrs. L. Valdez who was the wife of the Swiss engineer Arthur Möller, working in Mexico. He sent cacti to Switzerland in the 1920s. 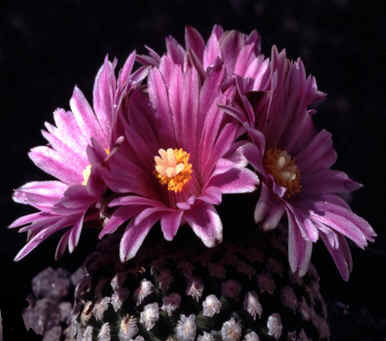 They are both celebrated in the name Mammillaria moeller-valdeziana. We won’t remember Norman for his cactus however as it is now a Turbinicarpus (top-shaped fruit). NAS, as you will know, means ‘Not According to Schedule’. In mid-June I judged the Wiltshire branch show. It was a very pleasant day out, just over 200 miles driving round trip without incident, drinks and food as required. Easy-ish parking. All I had to do was judge the show. Here I had some interesting problems. There seemed to be either four plants very close for the first three places, and maybe an HC or a simple easy winner and three more to separate for the next two places. When I look at any class, the first thing I check is that all the entries conform to any pot restriction. It happened that in the first few entries some of the pots were close and I broke out the callipers. As it happened, just OK. There is a little tolerance in the rules. However when I arrived at the class for one Gymnocalycium, another plant looked a little dubious as regards size. It was a very nicely grown plant of G. spegazzinii and was very tight in the pot; if it was within the pot size limit it would certainly be a card winner and probably first. I tried the callipers this way then that; as I said the plant was tight in its pot. Eventually it seemed obvious the pot was at least a ½ inch too big. I still think imperial but that is 12.7 mm. The small print of the ‘Guide to Shows’ says 3mm is allowed so this exhibit was regrettably NAS, and I marked it such. Toward the end of the judging we came to the class for the Kedrostis Group. There was a plant marked Trochomeria macrocarpa. Never heard of it, but never mind. There are some others I have never heard of. Let’s look in the ‘Guide to Shows’. Never heard of it there, either. In the small print again, a plant genus which can be exhibited in a BCSS show must be listed as ‘an official succulent’ in the ‘Guide to Shows’. And this was not. Now the Kedrostis Group is full of weird mostly caudiciform succulents, generally with trailing/climbing stems and small leaves and tiny flowers and our Trochomeria had a swollen root and just developing trailing arms. It fitted the general pattern of the family or Group. Now at the Judges’ Course test I would automatically NAS this plant, (as not in the ‘Guide to Shows’). I was caught recently on this aspect. However this was a branch show. I conferred with the Show Secretary who conferred with a member who had internet access on their phone. A miracle of modern technology. Slow connection etc. but Trochomeria was a member of the Cucurbit family so would fit the Kedrostis Group. It certainly looked a succulent. Except that it was not specifically mentioned in the guide. Therefore strictly NAS. While the tech wizards were looking on the net I judged the class as if the plant was eligible but there were three or four better exhibits. I am always mindful that in these strange things genera which do not get mentioned in the ‘Guide to Shows’ can have names that do. Did it have a synonym that was in the Guide? I expect that Trochomeria will be in the next ‘Guide’. You want more information? OK: one of its synonyms is Zehneria (also not in the Guide to Shows) microcarpa and it is on Page 92 of the Dicotyledon volume of the IHSP (so that makes it a succulent?) and illustrated as Fig XIV.a, (definitely, maybe a succulent). It is a native of West Africa and has an underground caudex (nearly typed tuber like the IHSP) and trailing stems with small flowers. Someone calls ‘Specks’ might sell it, but I wouldn’t bother. While vacillating about the best Cactus; (was it the Astrophytum or the Eriosyce? ), as it turned out both were grown by the same exhibitor. And the (tall) Astrophytum which I finally gave ‘Best Cactus’ to, needed propping up by another plant and Philip White chose a Dorstenia gigas which won the award of ‘Best Succulent’ for him as well. Well grown! I spent a long time deciding between that Astrophytum and Eriosyce and in the final analysis decided that the Eriosyce was probably (just) the best cactus but the Astrophytum was far more impressive and that was where I would award the prize. I really enjoyed the Wiltshire Show. They are a friendly and welcoming branch. At the show were the usual C&S sales but also a local alpine nursery and a display by the local Bonsai Society. A nice mix which suited me. Thank you.